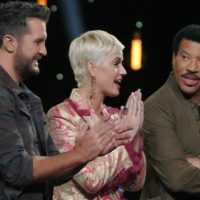 ABC/Eric McCandlessKaty Perry went through quite a lot of tissues for this Sunday’s American Idol. In an exclusive preview of the episode on People, one of the contestants gets a surprise proposal from her boyfriend and brings the recently-engaged Katy to tears. Johanna Jones was getting ready to walk off the stage during Hollywood Week when her boyfriend Matt walked on and got down on one knee. Katy immediately starts bawling, but to see Johanna’s full reaction — and whether or not she says yes — you’ll have to tune in. The proposal comes just after two of last season’s contestants, Gabby Barrett and Cade Foehner, announced their engagement Friday. In another preview clip on Entertainment Weekly, Katy needs tissues for a very different reason. She’s dealing with a cold, so she sticks two tissues up her nose and tells the contestants the show must go on. Luke Bryan challenges her to sing “Firework” with her nose plugged and she belts it out like a pro.